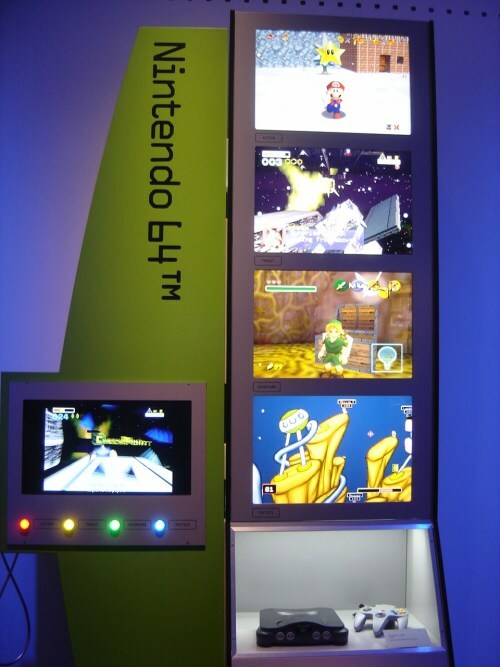 If you've been around Stencyl for a while, maybe you remember me mentioning this exhibit last year, back when voting (for what games would be included) was going on on its official site. Well, now the exhibit is open! I went there last week and took a few pics. c: You can stop by the Smithsonian American Art Museum in Washington DC to see it for yourself until it ends on September 30. 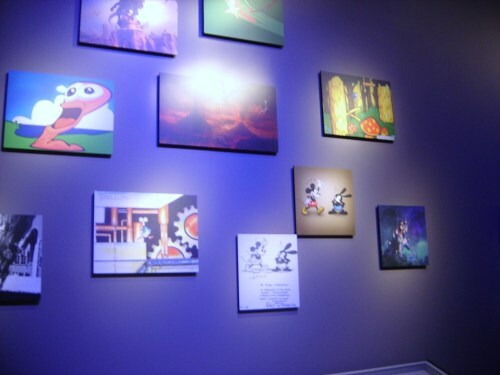 Here's a page with lots of info about the exhibit (the videos in particular are very cool!). 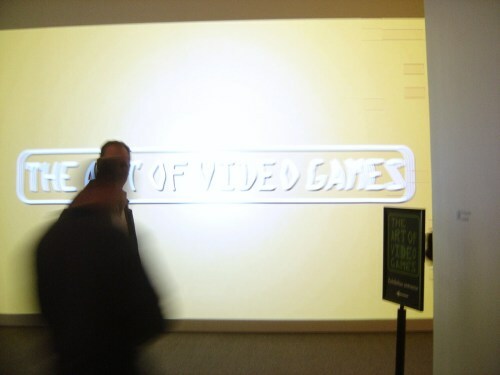 The very first thing you see upon reaching the Art of Video Games exhibit is this video montage of every game they feature. Taking pictures of it was hard haha. 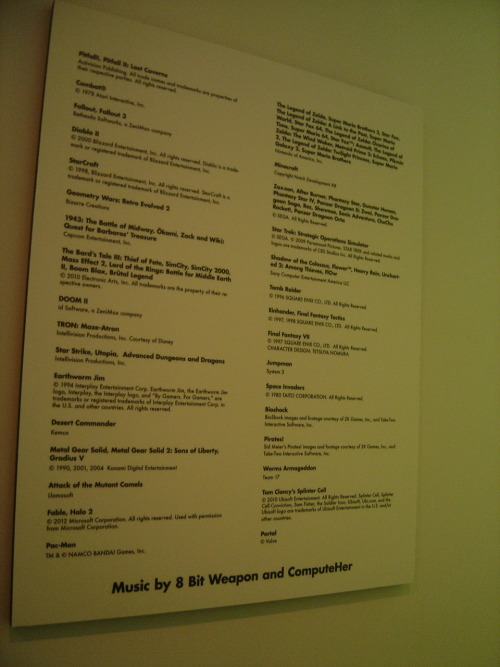 Here's all of the games featured in the video montage, along with music credits. Another little collection of concept art. 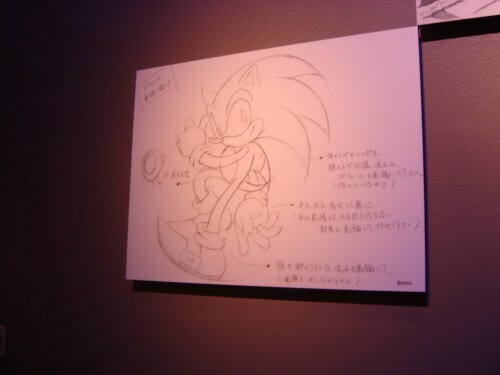 There are two Sonic stages illustrated here that I thought were cool - Mushroom forest (top right) and some factory (bottom center-ish-left). 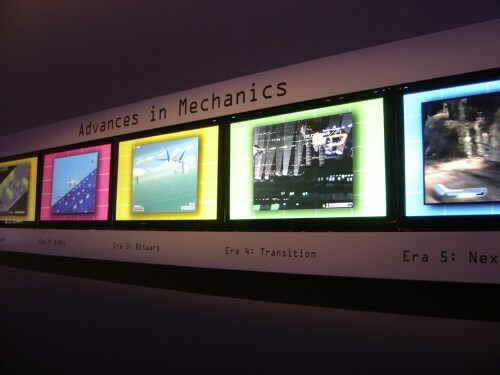 The games featured were categorized into these five eras. 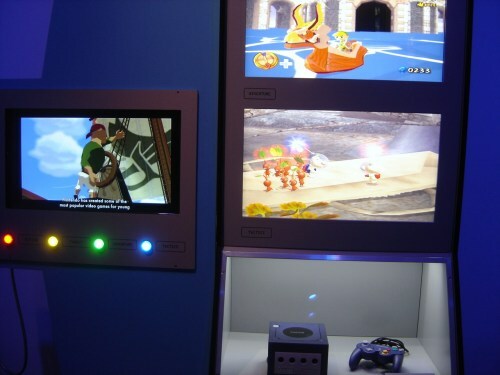 The next room had huge stations where anyone could step up and play a few minutes of one game from each of the five eras covered. 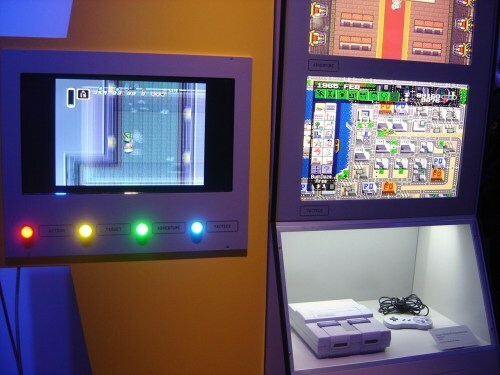 The playable games were Pac Man, Super Mario Bros, Secret of Monkey Island, Myst, and Flower. I'd never seen footage of Flower before this, although I had heard of it and it always intrigued me. Very pretty, meditative game. I'd like to make games like this. ...So I'm a little biased. 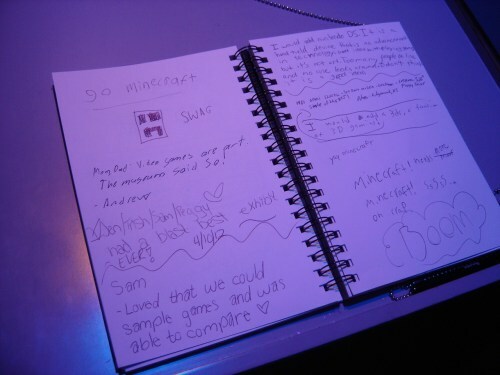 The guestbook at the end that was definitely worth flipping through to see what visitors were saying... This is the kind of stuff that was in it. Pages and pages of it. 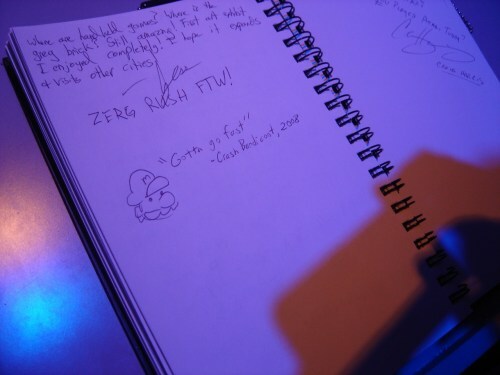 My contribution to the guestbook. 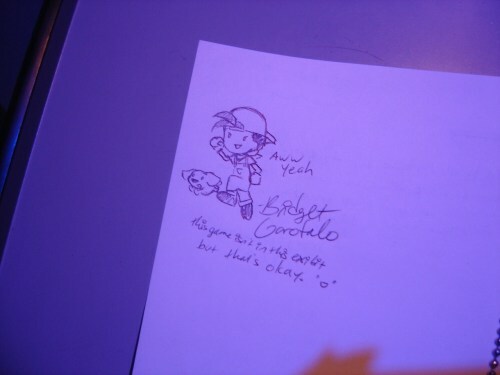 ...And Aaron's contribution to the guestbook. 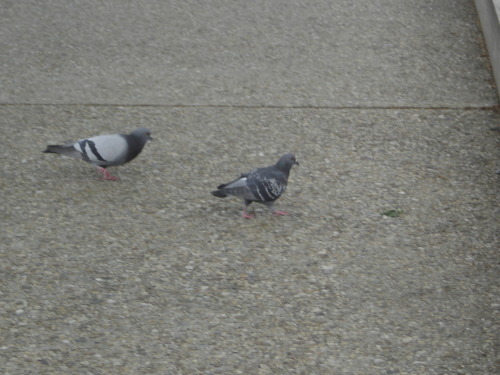 Oh yeah, and there were pigeons. I kind of... really like pigeons. And that's all of my pictures!! Video games are art!! The museum said so! Interested in this so hard. Game looks great. 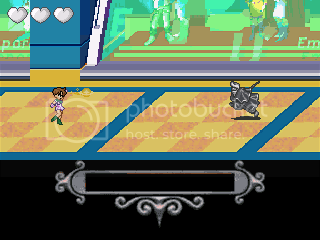 Still loading it so no input yet - just wanted to quickly comment that I've been fascinated by Daring Do since she appeared and I'm ecstatic that there are MLP games being made with Stencyl. I had only looked at Maps first, and realized the little blue guy you could place on the map looked familiar. I watched the video afterward, seeing that the font they chose for the logo mimicked the Dragon Quest logo. 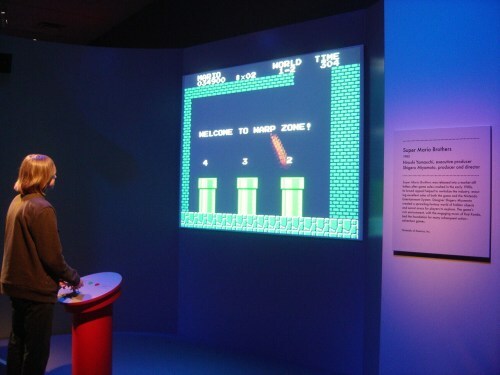 The grand kicker of all, though, was when the family got the 'game' running and that title screen music started. After that plays music from DQ's file select and overworld. Awww yeahhh. I just changed my whole desktop yesterday right after my Spring cleaning. n_n Uninstalled stuff I don't use and other such cleanups - ended up freeing 20gb! Wallpaper: No idea, found it on Tumblr I think. It's a scan of a sticker sheet based on the Sheep Garden print by Angelic Pretty though. Heya Stencyl-folks! I should stop being shy and post around here again. Here's something I thought was awesome and definitely worth sharing with the crowd here. Indie Game: The Movie is a video game documentary that focuses on the creative journey of independent game creators and developers. Featured most prominently in the film are Edmund McMillen and Tommy Refenes (Super Meat Boy), Phil Fish (Fez), and Jonathan Blow (Braid). A full list of everyone included in the documentary's footage is available on the site's FAQ page (fifth question from the bottom; the one with all the links c;). Screenings of the documentary are on tour all across the country, and there is also the option to buy it on DVD (preorder only for now). Slowly making my way through Skyward Sword. 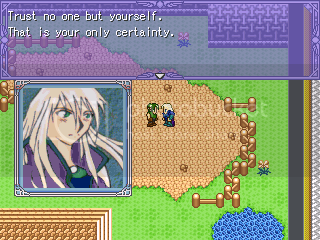 Keep coming back to Rune Factory: Tides of Destiny. But my opportunities to sit down with a console game are slimming. Lately on my laptop I've been playing otome games. One I really enjoyed was RE:Alistair. The gushing was omg so cute Ali. XD I'm so happy seeing you so happy! It's like one giant circle of HAPPY. I'm Bridget and I'm like cute things. I draw a lot sometimes. I dreamed that I lived in a Harvest Moon game, and lived on some kind of island, and had to use my epic time management and crop growing skills to uncover the mysteries of the island, before a train came to let off a robot that was going to destroy everything. Game Ideas / Re: What games have you completed in the past? I think I vaguely remember Futaiten: Book of Days. 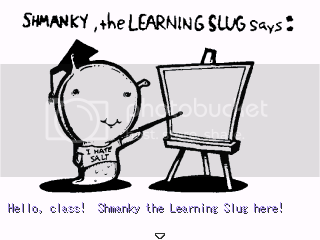 Did that have some kind of tutorial worm or something? Also I literally just now did this. Futaiten: Book of Days, created in 2005 according to the timestamp in the thread I originally posted it in. 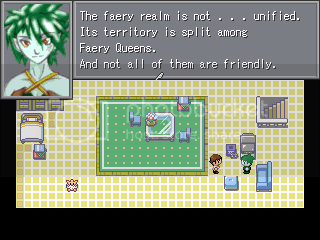 Faereality, the culmination of my love for magical girls, fairy tales, and pretty boys. I actually still allow my mind to wander back to this world, five years later. There is so much more that I dreamed up for it that never made it into the game. 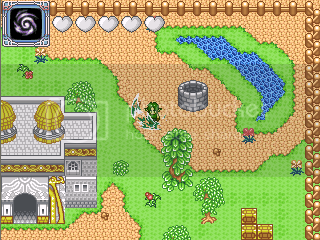 I need to revisit these ideas, redraw the characters, and bring these worlds back to life again. They deserve it.